Mario Mendoza was a light-hitting shortstop in the 1970s. Several of his teammates, as a clubhouse joke, started referring to anyone struggling at the plate as being “below the Mendoza Line.” (Mendoza’s career batting average was actually .215, but an average under .200 is now widely regarded as being under the Mendoza Line.) George Brett, who briefly played with Mendoza, fed the term to Chris Berman, who popularized it on ESPN’s Sports Center in the 1980s. After last night’s 18-inning “classic” the Giants’ team batting average is .199, so the whole team is now actually under the Mendoza Line. So let’s give it up for the Fightin’ Mendozas™! In a fun twist, Chris Berman, a lifelong Giants fan, was in the house for all 18 innings last night. Chris Berman is here and headed to visit Bruce Bochy. Stayed all 18. Legend. 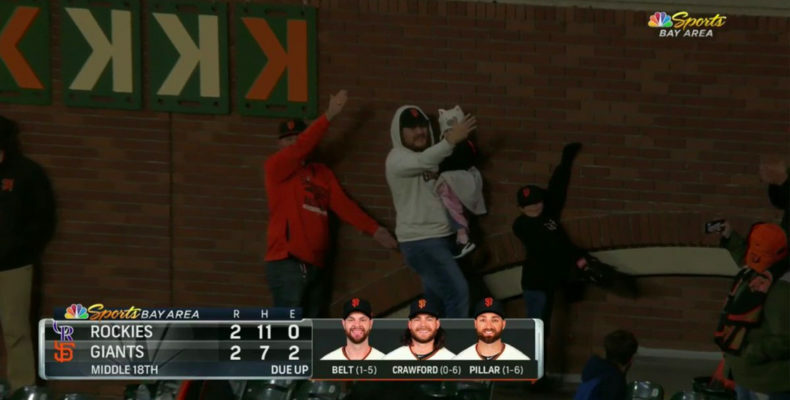 After 18 innings of mind-numbing offensive ineptitude by both the Rockies and the Giants, we finally got to our 18th-inning secret weapon, Brandon Belt, and fireworks ensued. Yes, actual fireworks. Here’s how the game finally ended. Brandon “Mr. 18th Inning” Belt led off with a double, and after two intentional walks, Belt was on third with one out. Erik Kratz–and OK, I’m not a fan of the Kratz Era, but you’ve gotta give it up for the 38-year-old dude who caught 18 innings–hit a dribbler to the right side. With the infield in, centerfielder Ian Desmond fielded the ball at second base and threw home for the force–but catcher Chris Iannetta pulled his foot off the plate, and after review, Belt was juuuuuuust safe at home for the walk-off (slide-off? review-off?) win. “I’m the best 18th inning player ever,” he said, laughing as he headed for a long overdue shower. “I’m 2 for 2 in the 18th, peeps,” Belt said. Who else can say that? Thus, this claim is one that Belt can hold for the rest of his career. It sounds like he will. This is a pretty good stat about Kratz’s night. I did not make it all the way through the game. I’d had a long day and a tough week, and I bailed after the twelfth inning. I woke up at 4 a.m. to do what ladies my age usually have to do in the middle of the night and checked my phone. I wondered if they’d still had the fireworks–surely there have to be city ordinances, right? Madison Bumgarner went home to bed because he’s starting today’s game at 1:05 p.m., so that’s why he didn’t pinch-hit when he otherwise certainly would have. Similarly, I have Saturday morning responsibilities to this blog, so I did the mature thing and went to bed at a decent hour. I’m guessing some of you won’t be reading this till the afternoon, though. The Giants did not have a hit or a baserunner between Steven Duggar’s single in the sixth inning and Longoria’s one-out single in the 12th inning. The two starting pitchers, Chad Bettis and Drew Pomeranz, only went five innings each, so the two bullpens combined to pitch 26 innings and give up only one run, the game-winner, in the 18th. The Giants’ three runs scored on a double-play grounder, a sacrifice fly, and a fielder’s choice. They had one hit with a runner in scoring position, but it was Duggar’s infield hit in the sixth with Sandoval at second, so no run scored. They were 1 for 5 with runners in scoring position for the game. That’s right: In 18 innings, they only had five at-bats with runners in scoring position. And they won. One of the Rockies’ two runs in the fourth inning scored on one of the more dubious and irritating balk calls you will ever see. The balk call also erased an incredible defensive play by Belt, which would have stranded a runner at third. Instead, not only did that run score on the balk, but Pomeranz also lost focus and gave up two more hits, a stolen base, and another run before a rare mound visit by Bochy settled him down to get the third out. Even though it didn’t end up counting, it’s worth showing this play by Belt. The Giants’ pitchers had so many strikeouts for the night (24!) that they ran out of Ks for the right-field wall, so a couple of punchy sleep-deprived fans improvised. Soooo…we can quibble about the fact that the Giants have scored three runs in the last 27 innings, but they won both games, the first time this season they’ve won two in a row. They’ve also clinched no worse than a split in this four-game series against the Rockies after losing their first four series of the season. On last night’s futility list were Crawford (0 for 6 with three strikeouts), Parra (0 for 6 with two strikeouts), and Kratz (0 for 6, but we’ll forgive him because he somehow managed to drive in the winning run). The Fightin’ Mendozas™ had no fewer than four position players who played the whole game with averages under .200 (the Mendoza Line)–Longoria, Pillar, Parra, and Kratz. The highest average of any of the starters by the time the night was over was Crawford at .241. That’s just desultory (had to throw that in because I’ve already used “ineptitude” and “putridity”). The Giants’ bullpen was already leading the NL in ERA before last night’s/this morning’s game, and suffice it to say they lengthened their lead after 13 scoreless innings. The bullpen ERA is now 1.93, and the team ERA is now second in the NL at 2.62. The way the Rockies are(n’t) hitting, the Giants’ staff may take over the league lead (from Pittsburgh) by tomorrow. So I hope Bumgarner got some good sleep and is planning to go nine today. The final four Giants’ relievers (Melancon, Gott, Vincent, and Bergen) went at least two innings each–Vincent went three–and you can’t imagine any of them are available for this afternoon’s game. Will Smith and Tony Watson have pitched the last two nights. So maybe Dyson has another inning in him (he just pitched one last night), and if not, stay loose, Pablo. Oh, and don’t forget that Kratz has four major league appearances as a reliever (ERA 3.60, and let’s not talk about his WHIP). Our plan for the day is to avoid campus and downtown Davis (it’s Picnic Day), take a spin in the convertible, and watch the Warriors embark on their playoff journey. Have a good one, y’all. Lefty out.